If you’re not adding “shift notes” to your schedule, you’re missing out! 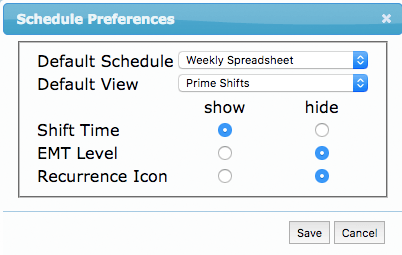 We recently added this enhancement to all eSchedule accounts. Shift notes allow you to add a text-based note on the schedule for any shift. They are visible in the Weekly Spreadsheet and Monthly schedule views. The text appears directly under the employee’s name and is visible to anyone looking at the schedule. We’ve been working with the team at First Arriving to integrate scheduled shifts within eSchedule directly into the dashboard. If your department uses First Arriving, please contact us. Click here to learn more about First Arriving and the features they offer. Time Clock User Defined Fields — This is a significant enhancement that allows you to track custom fields within the Time Clock Module. These will be new columns on your employee’s time card. For example: stipend, mileage, bonus, # calls, etc. To learn more, please contact our Support Team. Holidays — Added an “all day” option. Please join us in welcoming Alec Dulan to the eSchedule family! Alec is a developer (and a NYS paramedic) and will be working to further enhance the features within the software. Fun fact: Alec delivered a baby on a recent call! Congrats and welcome to eSchedule.